I was recently asked to put together an article detailing 42 ways beer & running play together in Canada. Unfortunately the final copy turned out dramatically shorter and quite a bit different from what my editor led me to believe. So here’s the full article, pretty much as it left my word processor. Maybe you’ve seen the conflicting studies about the merits of beer as a recovery drink. Does it really help with re-hydration or are you actually undoing some of the positive effects that come from a good run? The simple truth is a beer after running isn’t going to do you a world of harm, nor is it going to make you significantly more prepared for the next time you lock your laces. So just drink it and be happy. Beer & running go together like race kits & Instagram. And in Canada, we pair a race and a chaser very, very well. From West to East, in downtown cores, country lanes and wooded trails, Canadian Milers love beer as much as Canadian Marathoners love beer. You probably don’t need any more reasons to put the two together, but the next time you’re sitting at a pub, trying to rub the knot out of your aching calf, here’s 42 things you can ponder about how beer and running intersect in the Great White North. 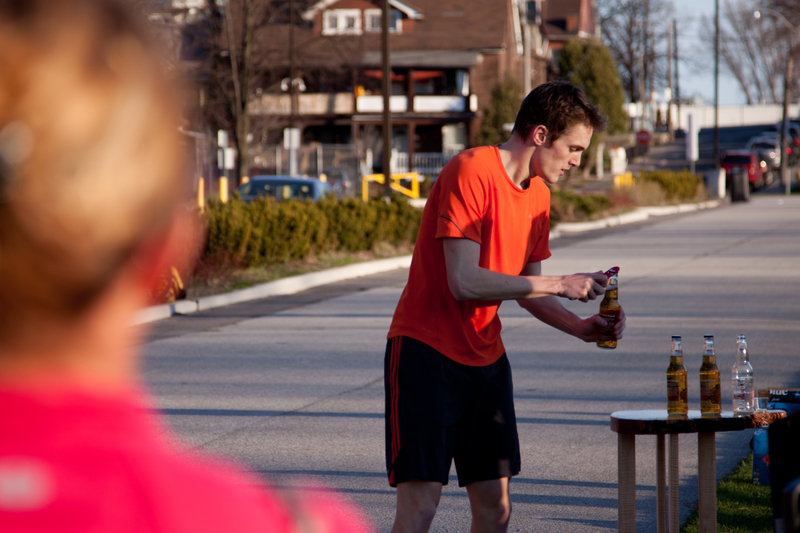 The Beer Mile is Canada’s gift to the rest of the beer running world. 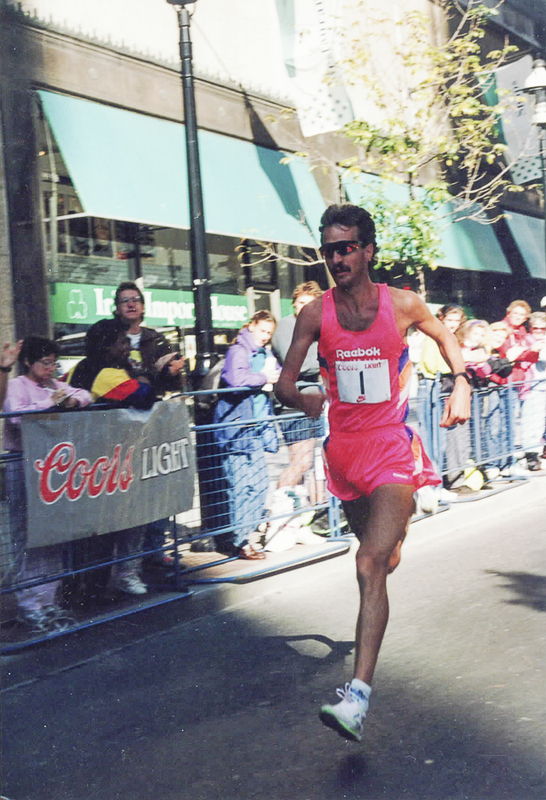 Back in 1989, seven friends in their late teens and early twenties got together for the first unofficial run, in Burlington, Ontario. One of those seven was 17-year-old (underage drinker) Graham Hood, who would go on to finish ninth in the 1,500 meters at the 1992 Barcelona Olympics. 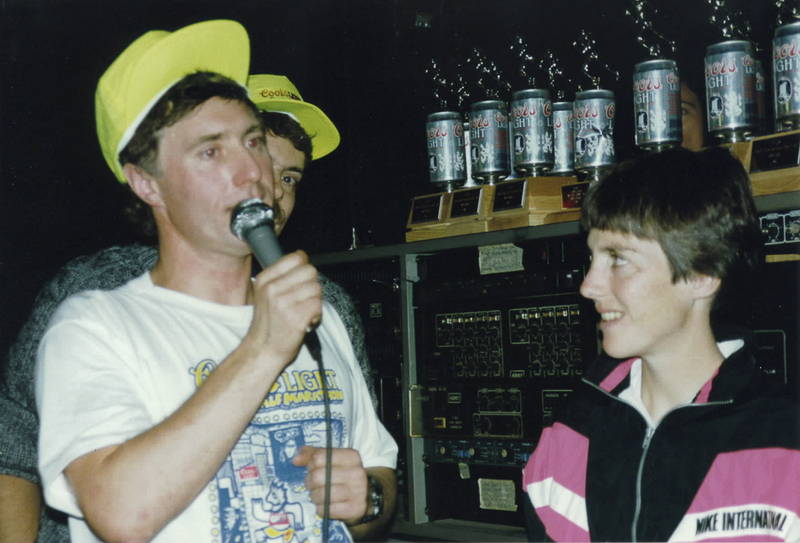 Members of that original seven brought the Beer Mile to Queen’s University in Kingston, Ontario, where the Kingston Classic set down the official ground rules – known as the Kingston Rules – which still govern the sport today. In 1997, Canada’s Seanna Robinson set the Women’s world record in a time of 6:42. Her world-beating mark would hold up until 2014. Not surprisingly, Robinson was a student at Queen’s. American James “The Beast” Neilson, who brought the Beer Mile to new prominence when he ran sub-5:00 last year… is actually born and raised in Canada. 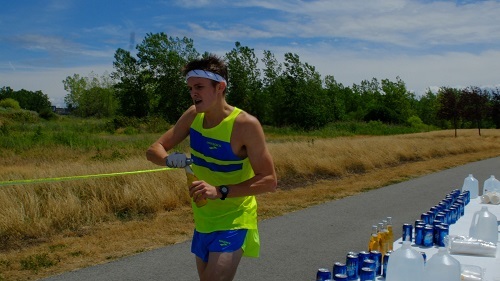 On August 8th, Mississauga’s Lewis Kent ran the fastest beer mile ever – a blistering 4:55.78 – breaking the record Australian Josh Harris set just one day earlier. Kent and his friends are pioneering a new beer running activity he calls the Pub Run. “We do our best to set fair teams of 5-6, and create a list of pubs you must run to, in order. The catch: each team must finish a pitcher at each bar.” The number of pubs and distance between each is based on the number of participants. Sidenote: Canadian sprinting phenom Andre de Grasse has to return to Canada if he wants to drink beer legally. The 20-year-old spends most of the year racing for the University of Southern California (USC). Beer Miles happen all over Canada but the most interesting might be the Trail Beer Mile an hour north of Ottawa… which means it’s in Québec, so 18-year-olds are welcome to join (actually so are the younger set, but they drink root beer, instead of the full-strength beverage from Ottawa’s Broadhead Brewing). Unlike a “traditional” beer mile contested on an oval track, this one loops a 400-meter path in the woods. 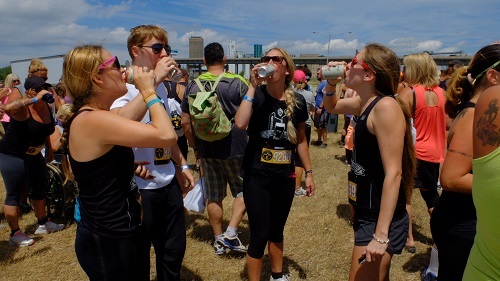 Brennan Harvey, one of the organizers of the Toronto Beer Mile (which has run seasonally since 2012) recalls one memorable race when competitors started shotgunning still more brews 100 meters after finishing their four beer in four laps. 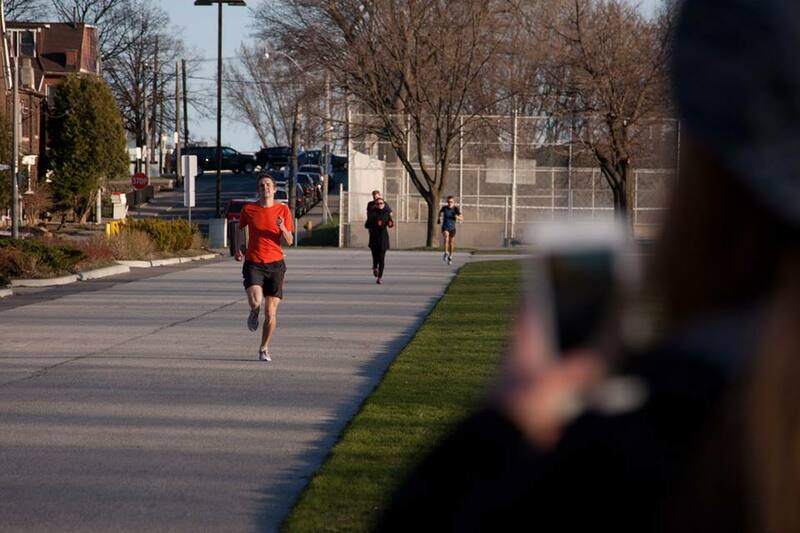 Two days after recently setting the new world record, Kent and fellow Canadian Beer Mile teammate, Phil Parrot Migas, joined RunTOBeer, accompanying 110 others en route to Toronto’s Rainhard Brewery. *Disclosure: RunTOBeer – Toronto’s craft beer running club – started in 2014 when I came up with the idea to get other runners together for a light workout before hitting a pub. Our first two runs, before we ever thought of naming the club, featured a grand total of two runners: Tej Sandhu & me. We now have more than 850 members, run at least once every two weeks and end our runs with free beer supplied by a sponsoring brewery. At the other end of the Dominion, the Fredericton Beer Run has been around since 2013 and this year attracted more than 300 runners, all of whom ended at a festival featuring 18 different breweries, plus cider and mead. Event spokesperson Lloyd Chambers said the run is staged annually on New Brunswick Day, to cap off summer long weekend. “We actually host the Fredericton Craft Beer Festival in March and the run came out of the idea of pairing our love of beer and running. 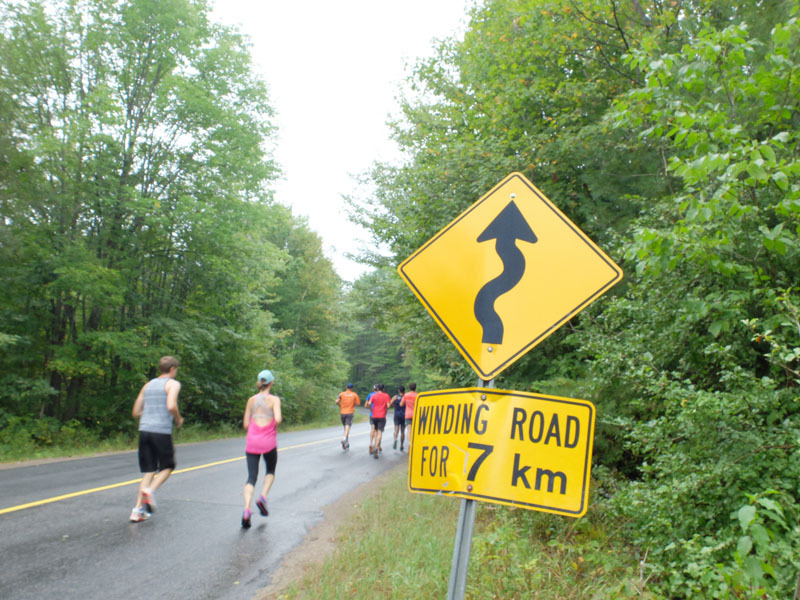 We planned a small event to keep craft beer visible in the summer and it just took off.” The Fredericton Beer Run has 4k, 6k and 12k distances. Down the road in Saint John, they saw the success of their New Brunswick neighbours and pulled together the first Port City Beer Run in May of this year. Distances for that race were 3k, 5k and 10k. You know who else does 3k, 5k and 10k? RunTOBeer. We do things differently from any other club I’ve seen however. Rather than everyone starting at the same point, our 10k runners travel half the distance where they collect the 5k crew. 2k later we meet up with the rest of the runners and all drink together. At RunTOBeer, we all drink together… like here at Mill Street Beer Hall. RunTOBeer inspired the soon-to-launch Winnipeg beer running group, PEG Beer Run Club. Headquarted at PEG Beer Co – a brewpub expected to open this December in the city’s Exchange District – runs will take place Sundays, ending back at the clubhouse. Says President & Founder Nicole Barry, “Our run club details will be announced on Twitter @PEGBeerCo this fall. We are also planning a bike club, x-country ski club, and a yoga club. Craft beer and active living fit so well together.” Barry – who hoped to start the running club earlier, but broke her foot – likes to follow her own runs with a Phillip’s Bottle Rocket ISA. Steve Abrams, co-founder of Toronto’s Mill Street Brewery, has been a runner since high school, when he was active in cross country and track. In 2012, he started taking it more seriously to honour the terms of a New Year’s Resolution. “I woke up with a particularly brutal hangover and decided this was the year I was going to really get back in shape and complete a full Marathon. So I signed up for the Scotiabank Toronto Waterfront Marathon, New Years Day and waited until the spring thaw to start serious training. I completed the Marathon with a less-than-stellar time but was proud nonetheless of the accomplishment.” His go-to beers after running: Pilsner in the summer, or a Mill Street Tankhouse or Oktoberfest when the leaves start to change colour. Another fan of Tankhouse is Canada Running Series Race Director Alan Brookes, whose office is stumbling distance from Mill Street’s Distillery District brewpub (not that he ever drinks during office hours, he assures me). 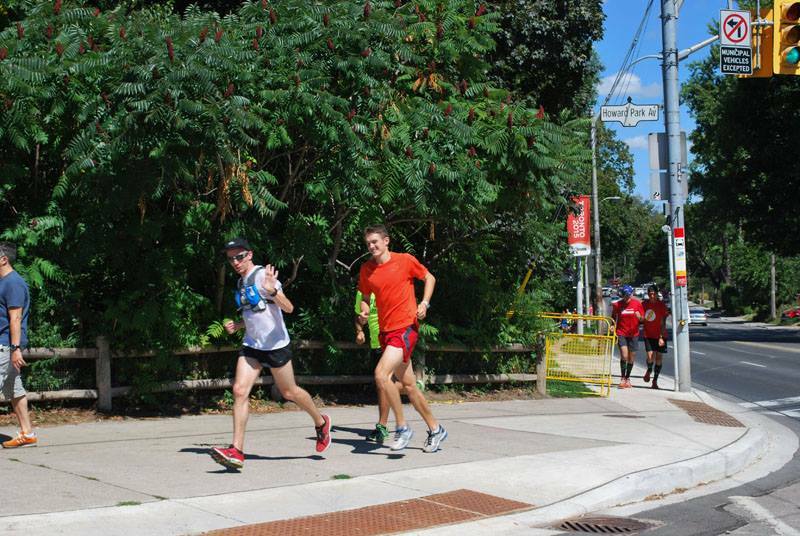 Last year Mill Street hosted the first “beer run tune-up” in advance of the 2014 Scotiabank Toronto Waterfront Marathon. It was so successful that other Toronto breweries – Amsterdam Brewhouse, Left Field Brewery and Rainhard Brewing – have also hosted tune-ups with Canada Running Series. Mill Street hosted its 2nd annual, on September 13th. Brookes says his organization’s ties to beer go back to its earliest days, when Coors Light hosted its first Toronto Half Marathon (that year there was no Toronto Marathon). At the time, according to Brookes, the radio market in Toronto was becoming saturated, and classic rock station Q107 came up with a plan to hang on to Molson’s advertising dollars. Molson had got the license to brew Coors Light in Canada when it was still commonly tagged as The Silver Bullet. “It was positioned as a downtown, yuppie beverage.” The radio ad exec had the idea to go to Molson and say that if he didn’t start spreading his beer money around to all the other outlets in town, “he would give them this amazing, healthy lifestyle, six-pack of road races in downtown Toronto as a gift-with-purchase.” Instead of just getting just a bunch of 30-second spots “he would have these unforgettable, run experience occasions.” From that came the Coors Light Toronto Half Marathon and 5k. Winners in the early days – including American Joan Benoit Samuelson, who won the first ever Women’s Olympic Marathon in 1984 – received trophies that resembled Coors Light cans with runners atop. Know who else loves beer? If you believe her Twitter bio, London, Ontario’s Lanni Marchant, who also happens to be the Canadian Women’s record holder in the Marathon. 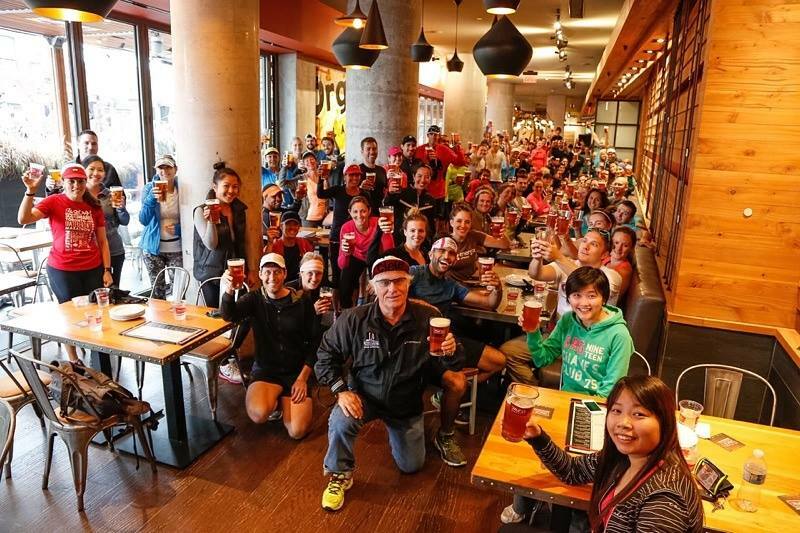 Canada Running Series is currently working with RunTOBeer to add more beer-related events to this year’s Scotiabank Toronto Waterfront Marathon, including a visitors’ pub guide and post-Marathon festivities. 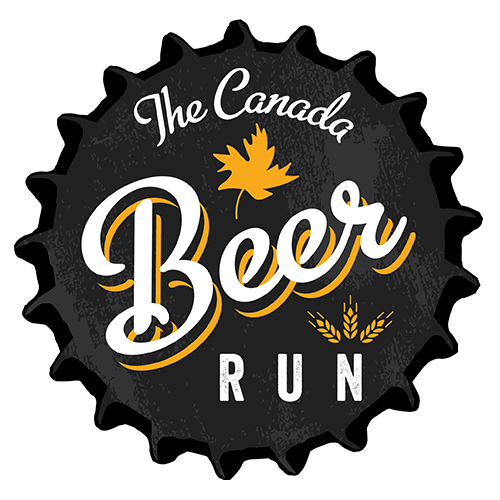 Another RunTOBeer partnership is Canada Beer Run, which did its Toronto leg in September, starting and ending at the Mill Street brewpub. We did a Father’s Day tune-up run to boost exposure and registration for the Toronto Beer Run. All 500 spaces for the 11.5 km route, which paused at 3 Brewers on Adelaide, Steam Whistle Brewery, Amsterdam Brewhouse and 3 Brewers on Yonge sold out. Canada Beer Run encourages costumes, water guns, whistles and plenty of other mayhem. The Toronto run spun out from the success of the Ottawa Beer Run, which launched in 2103 and now sells out an impressive 1,000 spaces. It’s grown so large that two separate routes – 9.5k and 14.5k options — are mapped to accommodate everyone. Along the way, runners sip from Big Rig, Lowertown, Beyond the Pale, Mill Street, Clock Tower, 3 Brewers and Kichesippi breweries. Look for the fourth location – Kitchener-Waterloo – to be added to the 2016 calendar. Maybe you’re thinking to yourself, doesn’t that region already have a run that coincides with the largest Oktoberfest outside Germany? They do. They have the K-W Oktoberfest 5k fun run. Oddly, it has absolutely nothing to do with beer. Edmonton’s Hash House Harriers seem to have found a way to include brewskis into any type of occasion, including snowshoeing during the winter and monthly runs on the Friday closest to the full moon. Impressive! Speaking of monthly runs, the Mikkeller Running Club now has chapters in three Canadian cities. 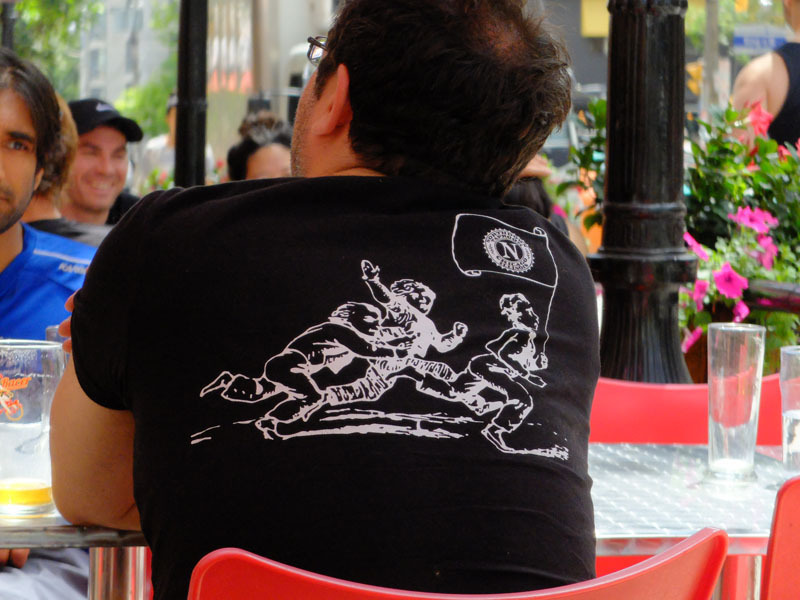 Part of a worldwide network that started in Copenhagen in 2014, members purchase a Mikkeller Running Club t-shirt, which entitles then to a free glass of Mikkeller beer at the end of each run. So if a runner from Chicago happens to be in Toronto on the first Saturday of the month – as happened in August – he can wear the shirt he brought from home and still collect his drink at the end of 5k. Vancouver’s MRC is led by Mark Galvani, a certified beer judge and manager of Steamworks Liquor Store in Gastown. Because Mikkeller Beer is curiously difficult to get into British Columbia, the Vancouver club ends each run at Steel Toad Brewpub, and drinks from the brewery’s own taps. The Toronto chapter of MRC came about after my RunTOBeer co-director, Tej Sandhu, happened to be in the U.K. when the London chapter debuted. One thing led to another, and we completed our first MRC run in June, starting and ending at the Bier Markt King West. Unlike our friends in Montréal, we already know we’ll be running through the winter. The Achilles 5k St. Patrick’s Day run starts and finishes at Toronto’s historic Roundhouse; home to Steam Whistle. The downtown brewery cheerfully shares its popular Pilsner at the conclusion of the race. If you’re looking for something a bit more rural, The County Marathon in Ontario’s Prince Edward County offers runners a free beer from Barley Days at the finish. Meanwhile, up in Ontario’s cottage country, Sawdust City Brewing organized a September 19th run, from Muskoka Brewery to their own brewery, some 13km away. RunTOBeer took 20 runners from Toronto, on a bus provided by Sawdust City. 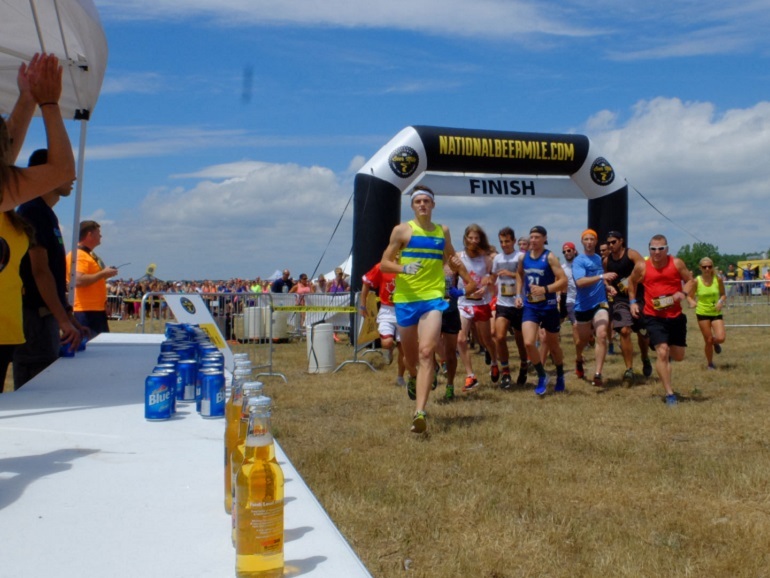 Brewmaster Sam Corbeil is a very active runner himself. Another trail run in the same area falls on October 4th, sponsored by Muskoka Brewery. It, too, is connected to RunTOBeer. We’re did a series of three “Venture Off the Beaten Path” trail runs in Toronto’s ravine and trails, with free pints of Muskoka Detour at the end of each session. Participants’ names were put into a draw for passage to the Muskoka run, with each additional pint of Detour purchased earning runners another entry into the draw. This guy needs an Ontario craft brewer to sponsor him. A few months ago, while my wife was out of the country, I thought it would be a good idea to try my first Beer Mile. I wasn’t wrong. My time wasn’t great, but I did have a great time. The best part though, was being in a field where one of the fastest Beer Miles ever was taking place. The guy who did this is 21. In fact Lewis Kent still gets carded every time he buys the beer he needs to compete (sidenote: Andre De Grasse is still 20, and can’t legally purchase beer where he spends most of the year). Since October, Lewis has shaved more than a minute off his time, and continues to improve at a pace that could see him crowned World Champion as early as this year. 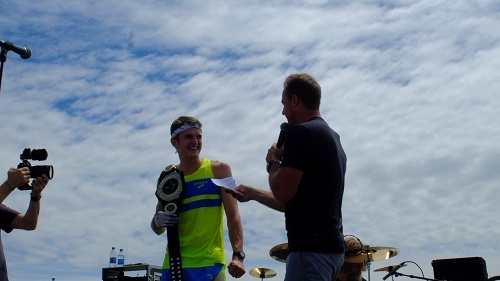 In a couple weeks he joins other members of Team Canada at the World Beer Mile Classic in San Francisco. You might already know Canadians invented the Beer Mile and claim a staggering number of the top times. This guy though… he’s something else. Right now Lewis is looking for a sponsor – a brewery that wants to have the beer-of-record when the world mark falls. And take note: beermile.com isn’t updating as frequently as it should be, but they do list the beer in the stats. To be eligible, the beer needs to be in 355ml packaging — ideally bottles — and should be at least (definitely not much more than) 5.0% ABV. To get a sense of just how remarkable the Mississauga runner is, here’s a video taken last month, where Lewis (in yellow) set the 3rd fastest time ever. The guy behind him — Phil Parrot Migas, also drinking Amsterdam Blonde — set the 9th best mark in history. They may have both fallen one place, as Australian Josh Harris awaits verification of his recently completed 4:56.2. Lewis tells me though, he expects to be under 4:55 before 2016 rolls around.